Sunday January 12 1908 It was snowing some today but we went down to Woolfs for dinner. We had such a good visit and Jennie such a good dinner for us. I read all the evening. Monday Januar 13 1908 We had a great time with the churning that put me back so with the work that it was three oclock before I had things all done. I made a little tatting. I wrote some in the evening. I got Lou [Reeves?] Simpsons address. wrote to her. 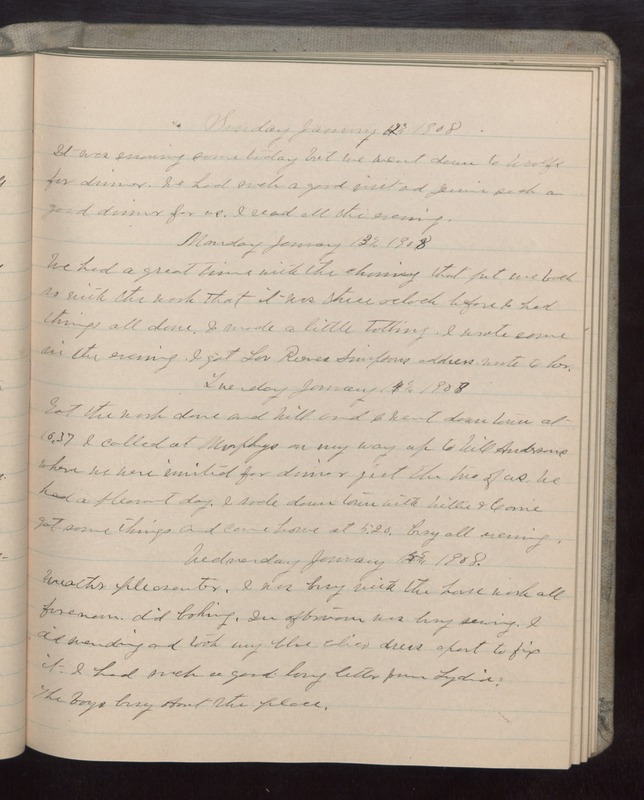 Tuesday January 14 1908 Got the work done and Will and I went down town at 10.37. I called at Murphys on my way up to Will Andersons where we were invited for dinner jist the two of us. We had a pleasant day. I rode down town with Willie & Carrie got some things and came home at 5.20. busy all evening. Wednesday January 15 1908 Weather pleasanter. I was busy with the house work all forenoon. did baking. In afternoon was busy sewing. I did mending and took my blue calico dress apart to fix it. I had such a good long letter from Lydia. The boys busy about the place.